With the ink still dry on her new veterinary license, Rodeo Queen Ruth Davis returns to Angel Springs as the new town vet. It seems her plans to save the world as a veterinary missionary are on hold. But, when her first patient arrives in the arms of battered rodeo man, Dodge Atwell, she realizes God has bigger plans than she ever dreamed possible. The last thing Dodge wants, or needs, in his life is Ruth. Her annoying habit of quoting Scripture only serves to remind him that she’s everything he’s not—Pure, innocent, good. When Dodge returns to her clinic, with yet another rescued dog, Ruth cannot help but become fascinated with the man and his scars—the physical ones there for the world to see, as well as spiritual ones she senses lurking beneath the surface. 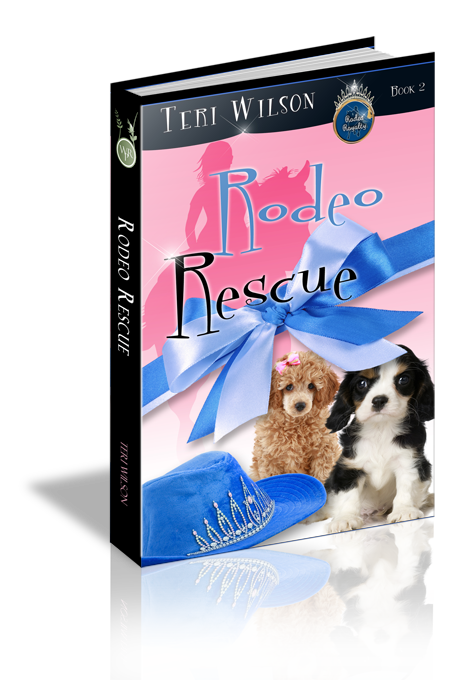 Could the reluctant animal savior be the hero she’s been waiting for all her life? Jesus Christ laid down his life for us. We regret to inform you. Perhaps the five worst words in the English language. Individually, they were harmless. But strung together, they rarely brought good news. She’d forgotten the letter was still crumpled at the bottom of her handbag, buried beneath her wallet, glasses and keys. How long had it been there? Long enough for her to realize everything she’d worked so hard for, all the plans she’d made, would never come to fruition. Long enough to put her dreaded Plan B into action. Long enough to come home. Technically, she wasn’t even sure if Angel Springs, Texas, still counted as home now that her parents had sold the house and were busy crossing the country in their shiny, new RV. She shook her head. Of course, this was home, the place where she’d grown up. Just because her family had moved on didn’t mean she didn’t belong here. Besides, if her home wasn’t here in Angel Springs, where was it? Home, by its very nature, was a constant, unmovable place. Someplace familiar. A vehicle with wheels and “new car smell” surely didn’t count. Standing here in her new veterinary clinic, with the smell of fresh paint lingering in the air, she at last mustered the courage to re-read the letter in its entirety. Those words again! Hideous. She made a face then forced herself to continue. …that your application for a permanent position with Hands of Mercy Veterinary Missions has been denied. Our organization has taken special notice of your frequent trips overseas to provide veterinary care to underprivileged and developing countries during your tenure at Texas A & M University School of Veterinary Medicine. In addition, there is no doubt your scholastic record is impressive. However, placement as a long-term missionary is generally granted only to those who have been in practice as licensed veterinarians for a minimum of five years. Once this qualification has been met, you are encouraged to re-apply. We pray that you continue your dedication to serving God as you develop your skills as a newly licensed veterinarian. The words on the page blurred and swam in a whirl as she stared at them through her tears until she could no longer make out the offensive opening phrase. She wadded the paper into a tight ball and pitched it into the shiny, new trashcan behind the front desk. It bounced off the edge and fell to the floor. Naturally. She bent down to pick it up. While opening her own practice in her hometown had never been her first choice, she took pride in the nice, neat appearance of the clinic. Especially today—her first official day of business as the town vet. She dabbed the corners of her eyes and sniffed. Get a grip, Ruth. You’ll frighten the clients away. Assuming, of course, that any clients actually showed up. She squinted out the window to the empty sidewalk out front and released a shaky breath. Her eyes fluttered closed. Please God, let them come. When she opened her eyes, her gaze was drawn toward the large portrait hanging on the wall directly behind the reception desk. The blonde girl with the powder blue Stetson, rimmed with an enormous, glittering tiara, smiled at her from the confines of her gilded frame. She never tired of looking at her Rodeo Queen portrait. All these years later, the memory of having that crown placed on her head still brought a flutter to her belly. It had been the perfect night. A night when anything seemed possible. Would she ever feel that way again? Ruth traced the image of the smiling beauty queen with her gaze, every fine detail of her face, each rhinestone on the twinkling tiara. She looked so beautiful, Ruth could still scarcely believe it was her own image looking back at her. She wrapped her arms around herself and nodded, a slow smile coming to her lips. God was faithful. If He had transformed her into a Rodeo Queen, He could surely make her into a successful veterinarian. Clients would come. She would help the pets of Angel Springs. She would be their healer and do good here. It might not be the kind of life she’d imagined—she wouldn’t be rescuing poor, downtrodden creatures from lives of extreme poverty or abuse. But, it would be a good life. A nice life of service. And maybe, after a while, she’d forget she once dreamed of saving the world. “Dr. Davis?” A voice behind her, thick and smooth like caramel, tore her from her reverie. He held the box toward her, as if it were meant for her, and dipped his hat. She could barely see his eyes beneath the black felt rim. They gazed back at her, dark and mysterious. Ruth looked at the box, and realization set in. Could it be? “Hmm. I didn’t see that coming.” She shook her head and made every effort to focus on the cardboard box. It was all she could do not to stare at the man, with his broad shoulders and firm biceps. What a difference a few years had made. An awkward silence settled between them and Ruth noticed him sneaking sidelong glances at her Rodeo Queen portrait. Ruth’s gaze flitted to his hands. They were the hands of a cowboy—big, weather-beaten, battered. “Why don’t you follow me?” She turned and led him to one of her pristine, new examining rooms. She flicked on the light switch, and the room glowed with a soft, powder blue warmth. Her favorite color. She felt a surge of pride, standing behind the counter, waiting for a glimpse of her very first patient. Moving with exaggerated slowness, Dodge lifted the flaps from the top of the box. He reached inside with a tenderness so at odds with his gruff exterior, it caused Ruth’s heart to leap straight to her throat. She gave a small cough and made a fervent attempt to appear professional. All hope was lost, however, when she at last saw the dog. It was what appeared to be a tiny poodle, fur matted nearly beyond recognition and far smaller than it should have been. Cradled in Dodge’s massive hands, she was the most pitiable creature Ruth had ever seen. And she’d seen more than her share of pathetic animals on her veterinary mission trips.